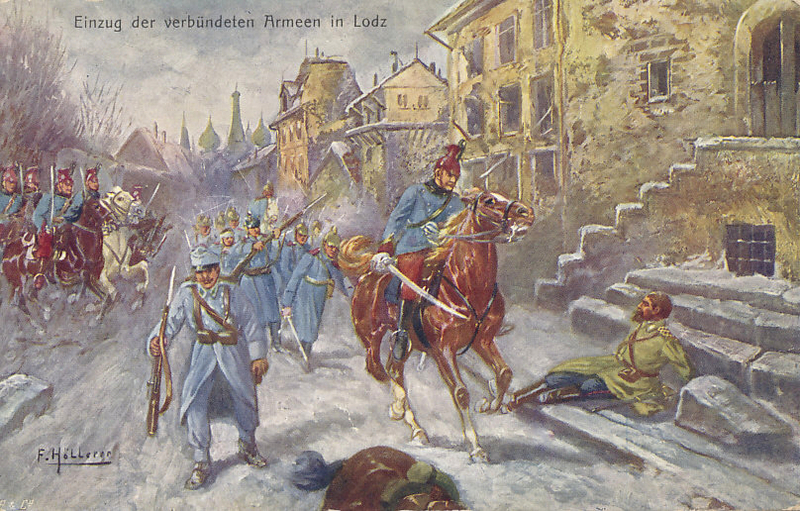 Postcard of the entry of the allied German and Austro-Hungarian Armies into Lodz, in Polish Russia, after the Russians evacuated the city on December 6, 1914. A Russian officer, presumably wounded, lies on the pavement. 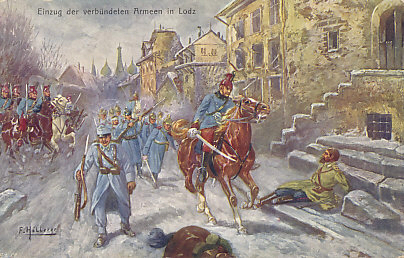 The postcard depicts an Austro-Hungarian calvaryman and foot soldier leading the column of German soldiers, but the victory belonged to Germany, not their ally who was at the time being pushed back in the Carpathians and around Cracow. Illustration by F. Höllerer. Einzug der verbündenten Armeen in Lodz. Entry of the allied armies into Lodz. In the Galician Battles of August and September 1914, Russia had driven Austria-Hungary out of its northeastern province, and threatened Germany's industrial region of Silesia. In October, Russia was reaching full mobilization and planned to continue its advance westward with four armies. In September, German Generals von Hindenburg and Ludendorff created the German Ninth Army to defend Silesia and retake the offensive. They planned simultaneous offensives: one German-Austro-Hungarian with two armies through Polish Russia, the second with three Austro-Hungarian armies to retake lost territory. The Battle of Ivangarod began on September 28 with an advance across a broad front that brought the Germans through western Poland to the Vistula River, Warsaw and the Russian fortress at Ivangorod. The Austro-Hungarians also advanced, reclaiming territory, and relieving the siege of the fortress city of Przemyśl. By October 9, through captured Russian plans and radio intercepts, Hindenburg and Ludendorff began to understand the size of the forces they faced, but they continued their advance until the Russian counterattack, beginning their retreat on October 17. 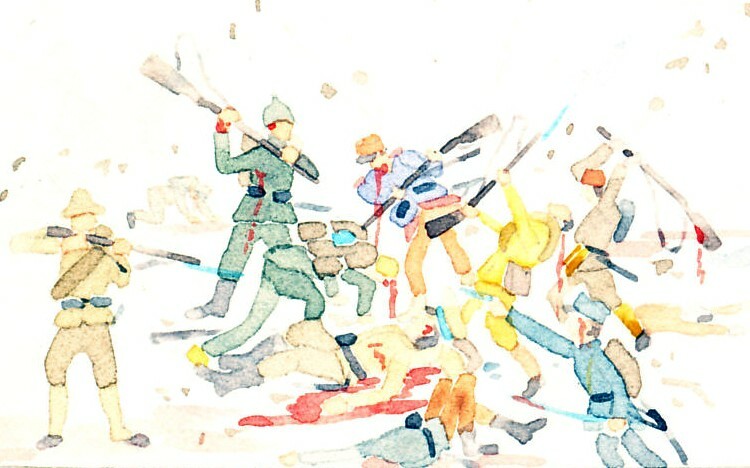 By November 1, both sides had returned to their September positions. The Russians planned to continue their invasion of Silesia. To thwart it, Hindenburg and Ludendorff planned an offensive further north where the Russian First and Second Armies met. From November 4 to 10, the German Ninth Army moved north by rail. On the 11th, they attacked, driving back the Russian First Army and separating it from the Second. The Germans threatened to encircle the Second Army at the city of Lodz, but Russian reinforcements from south and north prevented the German maneuver, and put the Germans at risk for the same fate. 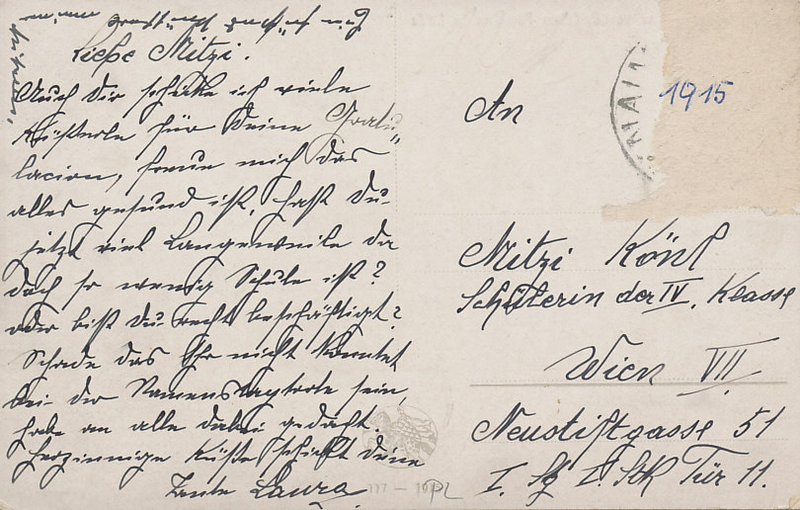 Still threatened, the Russians evacuated Lodz and much of western Poland on December 6, 1914.